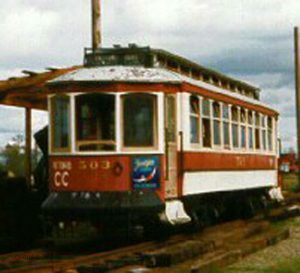 Part of a series of 10 cars built for Portland for use on the Council Crest line. This cars was originally numbered 203. Cars of this series do not have air brakes, rather they have magnetic and hand brakes. Gearing was also low. This is so they could climb and descend the steep gradients of the Council Crest line. The Council Crest Amusement Park was built in 1906 to promote ridership. It offered a Ferris wheel, a scenic railway, a dance pavilion, and an observation tower. The park was closed in 1929 after the Jantzen Beach Amusement Park opened. The final operation on this line, and the 2 other remaining narrow gauge city lines, occurred on February 26, 1950. Car 503 was donated to a Boy Scout troop by the Portland Traction Company. When the Museum acquired it, the trucks and controllers were missing. In 1985, Melbourne W-2 standard gauge trucks and British controllers were installed so that it could operate at the San Francisco Trolley Festival. 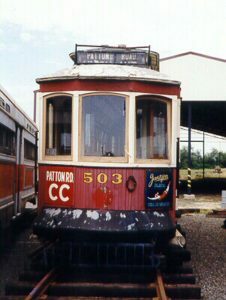 It returned to the Trolley Park, where it ran until the years of deterioration put it out of service. 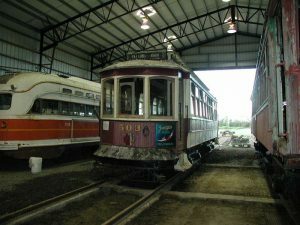 This car served as prototype for the Vintage Trolley cars built by GOMACO of Ida Grove, that ran the Portland’s light rail MAX system between Lloyd Center and downtown. Now 2 of those cars are on the Willamette Shore trolley, and 2 others were sent to St. Louis.